Your one-stop, affordable resource for everything you need to become a notary! Fill out our step-by-step application and get your notary commission completed fast! we send your notary package. When it comes to notary commission applications, every state has different requirements. Here at Notaries.com we make it easy by consolidating all the required information into an easy online form (or printable pdf) for anyone interested in becoming a notary. 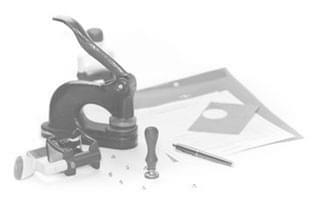 We make sure to get you everything you need to become a first time notary or complete a commission renewal. To learn about the requirements in each state, visit our How-To Guide for more information. Please read and follow all of the directions carefully. You'll find that the questions are easy to understand and straightforward. However, we've added extra instructions in areas where errors are most common. Your application is automatically saved after you complete each section and click "Save and Continue." As soon as you complete Section 1 you'll be assigned a customer id number and password, which we'll send to you at the email address you provided. If needed, you can use these to sign into the website and complete your saved application. We are happy to help, so if you have any questions not answered in the directions, please don't hesitate to call us toll-free at 1-800-422-1555. In order to minimize time-consuming delays and rework, please use our checklist (in Section 11) before mailing your application and supporting documents. Every time I call the staff is very kind, helpful and friendly. They actually answer the phone - a nice surprise in today's business environment. I've used Huckleberry for 16 years. They’re the best! They processed my notary renewal in a timely manner and made it so easy. Copyright © Notaries.com, All Rights Reserved.